Eventing Yard Workout – No Excuses! With the eventing season looming MetaFitness instructor Samantha Hardingham asks ‘are you as fit and lean as your horse’? 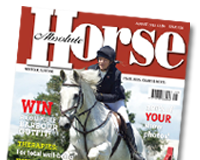 Read Samantha’s column in the February edition of Absolute Horse to find out how you can incorporate HIIT training in to your life.